Our PermaSEAL green roof membrane has an integrated geotextile fabric firmly bonded to the membrane. This prevents slip and compression of the fabric against the membrane. This geotextile layer also filters out fines and other particles to ensure your green roof can thrive. 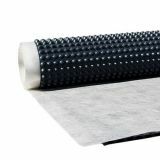 This bonded geotextile filter layer also saves time on installation compared with laying a separate and loose geotextile layer. Our green roof membrane is suitable for both pitched and flat, intensive and extensive systems. It is also suitable for walkable and drivable deck paving drainage applications. Installation is straightforward. We supply the membrane in 20m² roll sizes - this mean the membrane can be handled easily by one person. This makes it ideal for DIY green roof installation as well as professional installation. Once a primary waterproofing layer has been applied to the concrete roof deck or screed, and a root barrier/slip layer if required, you can roll out the green roof membrane across the length of the roof. You should then cut the membrane to size. PermaSEAL Root Barrier & Separtion Layer – used as a slip layer/root barrier membrane between the primary waterproofing and PermaSEAL 8 Green Roof.